Battling with hard-to-style, fine hair? Believe me, I know the struggle. Having fine hair means that individual strands of hair are thin and delicate. 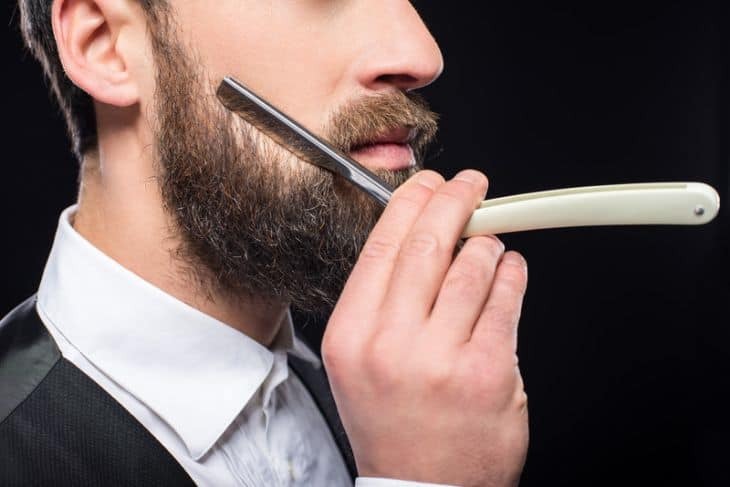 Because they are so light, fine hairs tends to move around a lot, meaning that, without styling, your hair may sprawl out into a mane or even knot and tangle. To make matters worse, styling fine hair with heat tools can be a dangerous game since fine hair is prone to damage caused by heat. So, how do you tame and style fine hair? Fortunately, plenty of beauty experts have dedicated time to developing beauty tools just for us fine haired beauties! Even with fine hair, you can create almost any look using a flat iron—straight and sleek, wavy and chic, or even curly and neat—it’s the most versatile hair styling tool! That’s why we went on the search for the best flat iron for fine hair. And—guess what—we found it. Now that you know what to look for we’d like to present you with a few of the best hair straightener for fine hair. Each of these flat irons are ideal for thin or fine hair, and they produce salon-quality results. We love this ceramic flat iron from HSI Professional! You can spend all day creating your bouncy curls—this flat iron uses ceramic tourmaline plates that glides smoothly on your hair. These 1 inch plates don’t just protect your hair from unnecessary heat damage, they also add shine and eliminate frizz with its ceramic ionic system. The HSI Professional Glider flat iron clearly has some of the best features. But thing that makes this hair straightener a candidate for best tourmaline flat iron is its use of infrared technology. That’s right, this flat iron uses advanced infrared technology in order to heat up quickly. The flat iron with the largest range of temperatures is the HSI Professional flat iron. This guy can heat up anywhere between 140° F and 450° F making it a great choice for fine hair! The temperature is adjusted using a dial button. Not to mention, finding the perfect amount of heat is simple to do with a dial temperature control. You should also note that the HSI glider automatically adjusts the temperature for evenly distributing heat for best results. This is done with the help of integrated chips on the plates that continuously monitor the plate surface temperature. This iron has floating plates with rounded edges, making it a great tool for quick and beautiful curls. The iron holds well without getting caught and those with fine hair will love this. The only thing missing from this professional quality iron is the automatic cutoff feature. So make sure you switch it off after each use for better safety. The HSI professional iron supports dual voltage mode and has a 360° swivel cord for flexible operation. You also get a decent amount of extras with this iron. The pack comes with a heat protection glove, Argan oil leave-in conditioner and nice heat resistant travel pouch. This particular flat iron has been one of the preferred brand and models for professional hair stylists. Check the below video to see its features. 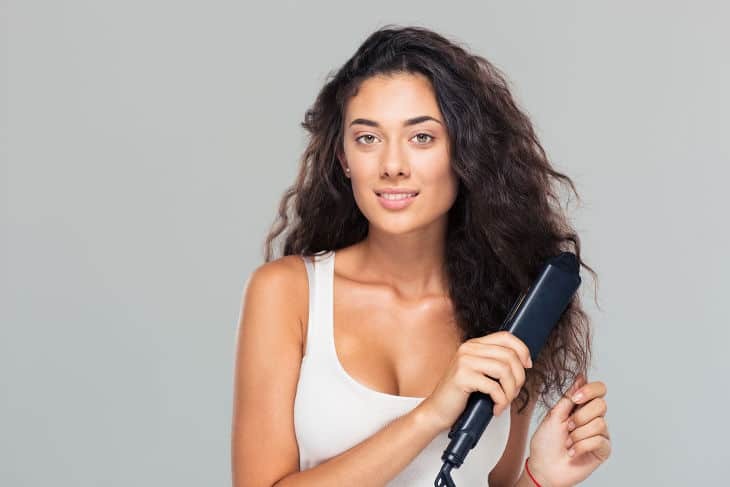 If you’re hesitant to get yourself a flat iron because you worry about the excessive time it takes to do your hair, then the Remington S5500 may be the best flat iron for thin hair. That’s because this 1 inch flat iron features long floating ceramic plates with anti-static technology. The anti-static technology reduces negative charged ions to reduce frizz and the long floating plates give you good style control. You’ll never experience brittle, fried hair with the Remington flat iron. This flat iron can heat up from 310° F up to 410° F and that too in just 30 seconds! The light-up LCD displays the temperature radiating from the ceramic plates, and a pair of simple buttons allows you to increase or decrease the temperature. In this way it is simple to find and remember the proper temperature for styling your hair. It has a turbo boost feature that lets you hit the highest temperature by pressing down the plus button. A 60 minute automatic cutoff is another useful feature of this iron, especially for those who forget to turn off the irons after use. Colored ceramic plate irons are hard to find, and this model comes in purple color! You’ll have glossy, conditioned hair after straightening with this flat iron. It has a good long swivel cord, allowing you to style wherever you want. Presenting the BabylissPro Nano Titanium Ultra-Thin flat iron! Babyliss is one of the top manufacturers of hair styling tools that has a plethora of straighteners of all types and shapes. The BabylissPro Nano Titanium Ultra-Thin is one of the best straightener for fine hair on the market today. The 1 inch flat iron is really thin in spite of having a 5 inch long plate that allows faster straightening or even curling. The titanium plates heats up faster than ceramic irons and maintains high temperature easily. They also emit negative ions for locking moisture in to the smooth hair shafts. The titanium makes it lightweight and enables to cover wider areas to reduce hand fatigue. Furthermore, the body is made of Ryton, a special material that can resist high heat. With up to 50 multiple heat settings, you can choose the optimal temperature for your unique hair. It starts from 240° F can reach up to 450° F by adjusting the temperature dial. Although it does not have a light-up display, it is also possible to fine-tune this flat iron to the approximate degree. One need to exercise some caution while using this iron as it can heat up quickly in about 40 seconds, so it is best to use it at lower temperatures if you have fine thin hair. It comes with swivel cord but there is no automatic cutoff or a temperature display for this flat iron. However, what this flat iron lacks in features it makes up for in its high quality results and ability to heat up quickly. Titanium irons are expensive in comparison with ceramic irons as titanium is superior material and give salon like quality. It is recommended to use a heat protection spray before ironing your fine hair. Also titanium plates has high heat retention and smoothness—that’ll make your fine hair look healthy and styled every time. The Xtava Pro-satin is an elegant flat iron that uses ceramic tourmaline ionic plates. The ultra-wide 2 inch iron plates use infra-red heat technology to heat hair from inside, thereby locking moisture and reducing frizz. It uses an advanced microprocessor with LCD display for precise temperature settings. That means you can add as much (or as little) heat as you want—especially great for heat-sensitive fine hair. You can choose from 10 temperature settings between 265° F to 445 °F and it heats up in just 90 seconds. For fine hair a temperature between 265° F to 300 °F is recommended. Not only does this flat iron have wide ceramic plates—they are coated with tourmaline for silkier hair. That means heat is more evenly distributed while curling your hair with the flat iron. These plates are easy on fine hair and add shine. Another interesting thing about this flat iron is that the grip is especially easy to hold and maneuver. Since it has a swivel cord, this flat iron is easy to twist and turn while flipping out or curling hair. This is also means that you can pull the flat iron through your hair without running into any stops. The Xtava Pro-Satin iron is another best tourmaline flat iron that has a 60 minute automatic cutoff feature, travel lock, dual voltage support and comes with a heat resistant travel pouch. Learn how to use Xtava Pro-Satin using the below video. Check out RUSK’s flat iron that uses CTC STR8 technology for best results. What’s that? CTC or Ceramic Titanium Complex stands for titanium infused ceramic plates. It combines the best of ceramic and titanium irons in a Ryton housing for straight, smooth and shiny hair. This material in combination with sol-gel technology aids in transferring heat evenly from root to tip, which allows the straightener to glide over hair without getting caught. In a word, this flat iron is capable of heating hair evenly for a clean look free of fly-away hairs. You can adjust the temperature from 300° F to 450 °F which can be seen on a LED display. It heats up in less than 60 seconds. This flat iron is 1 1/4 inches with rounded edges, so you can create large voluminous curls, or straighten your hair thoroughly in no time at all. The plates on this flat iron are made of titanium-infused ceramic. This also adds some shine to your hair, though it does not condition as much as the Xtava flat iron. The RUSK flat iron has earned its candidacy for best titanium flat iron because the plates are made of ceramic titanium. It has a long swivel cord that does not get tangled. Fine hair is delicate and sensitive to heat, so, if you want to take good care of it, you need specialized products. While shopping for a flat iron for fine hair there are a few things to consider. 1. Ionic – An ionic device means that it is able to generate negative ions during use. This feature is quite useful for hair care devices like hair dryers and curling iro﻿﻿ns as hair is full of positively charged due to high water content. So when you add negative ions, it neutralizes the positive charge to remove frizz and manage the hair easily. Ceramic and titanium generate negative ions with the latter a stronger producer. 2. Flat Iron Types- The popular type of flat irons available are as below. Ceramic Flat Irons – They are the most popular type of flat irons and uses ceramic plates that heats up quickly and maintains an even heat for flexible styling. They are best for home use and majority of flat irons are ceramic based.Look for fully ceramic plates as opposed to cheaper ceramic coated plates that won’t last long. Ceramic Tourmaline Irons- Tourmaline is a semi-precious mineral stone that produces high quantity of negative ions. They are made into fine powder and coated on ceramic plates for even more frizz control and shine. Titanium Flat irons- Titanium is a metal with high heat conduction and responds faster to temperature variations resulting in irons with better temperature control. Also it ionic capacity is more than a ceramic iron making it the first choice for professional salons. They work faster and is quite light in weight when compared to ceramic irons. 3. Infra-red Heating- Traditional heating irons subject hair to high temperatures in a damaging way. To overcome this some of the new irons make use of infra-red heating system. They heat the hair from the inside and locks the moisture within the hair cuticles thereby preventing hair damage. For those with fine hair this is a useful feature to have. 4. Temperature Settings- You’ll want to know the range of temperatures the flat iron is capable of reaching, as well as how finely you can adjust this. Flat irons designed for fine hair offer more heat protection than traditional models so you can have smooth straight hair without fried ends. However, if your hair is thicker, these straighteners may not be fit for your hair. That’s because thick hair requires more heat to be styled (but don't worry, thick hair can also withstand hotter temperatures without getting damaged). For those with fine hair the recommended temperature range is from 140° F to 300° F. For most types of hair 300° F to 360° F will work well. Thick coarse hairs can use temperatures above 360° F Look for an iron which allows greater temperature control with a digital display. 5. Plate Size – The size of the flat iron is also worth considering when looking for a new flat iron. The most common size suited for fine thin or short hair is 1 to 1.5 inches. For those with long coarse or thick hair can opt for plate sizes up 1.5 to 2 inches. Bigger size plates saves you time but can be hard to hold and use while smaller plates are easy to use. Smaller irons with rounded edges can also be used for curling you hair. If you intend to use your flat iron to create curls, it is important to look for a flat iron with a rounded shape. The flat irons should be thin and easy to hold and use. A 360° swivel cord with good length is quite useful to prevent any burning of you hand while using the iron. 7. Other Factors- Some of the other factors to consider are heating time, floating plates, automatic cutoff, wet hair use, heat protective gloves, LED temperature display, travel lock and travel pouch. So, which model is the best flat iron for fine hair? It was a difficult decision, but our favorite was the HSI Professional Glider flat iron. This model simply has it all—from multiple heat settings up to 450 degrees to ceramic tourmaline plates with infrared heating technology. You can straighten, flip, or curl your hair easily with this flat iron because of its rounded edges and gliding plates. You will absolutely love this flat iron! The BaBylissPRO is AMAZING! I actually went back and got the mini so I am happy to see this one make the list. They do cost more but they are so much healthier for your hair. I am looking to find a cheaper flat iron for my sister. She wanted me to pick her one out for her birthday since she isn’t good with buying hair tools. This article made it easier for me to find just want I was looking for!